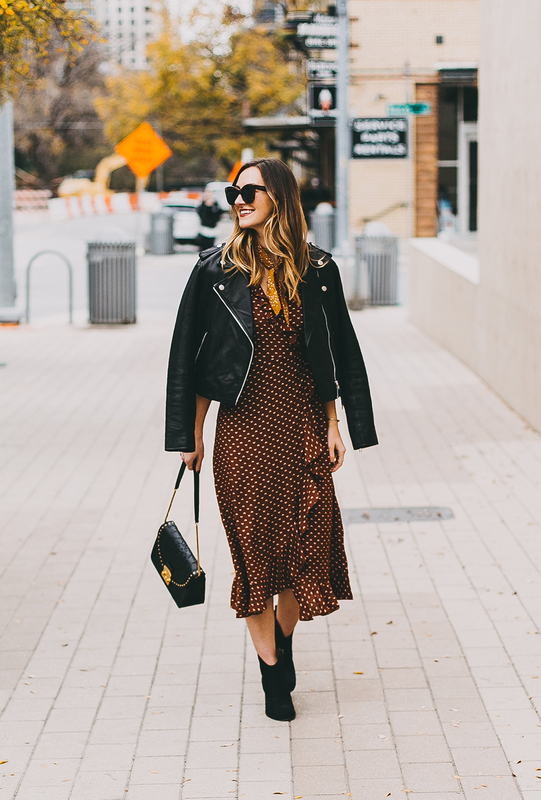 Ohh this wrap dress with a leather jacket – I kind of died a bit when I put the two together, it is truly a showstopper combination! 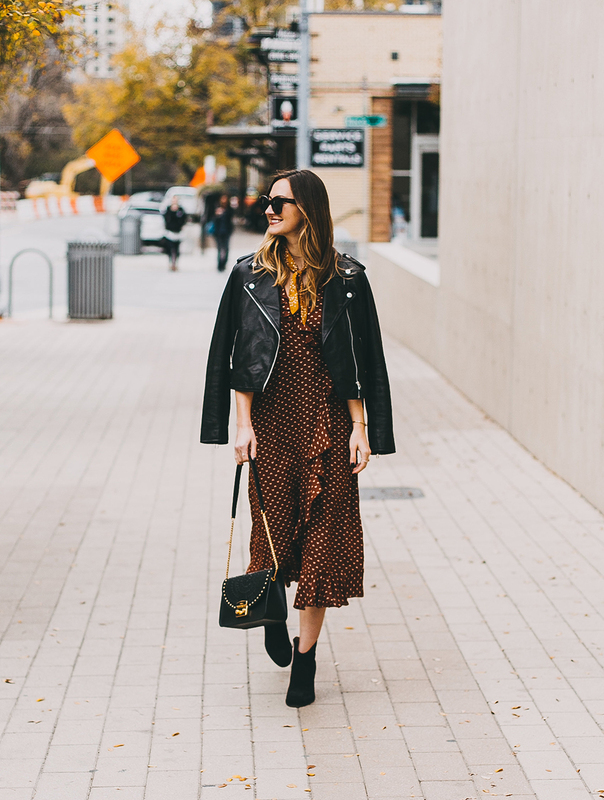 As we inch closer to the holidays, I’m excited to have my friends back in Austin…which means lots of dinners, cocktail hours around town (…and lots of excuses to rock some adorable outfits! 😉 ). My wrap dress is from Urban Outfitters and OMG is it absolutely stunning!! It comes in three colors, but I couldn’t resist this rich burgundy. You can see how I styled it with a sweater in this post from last week (also so precious!). 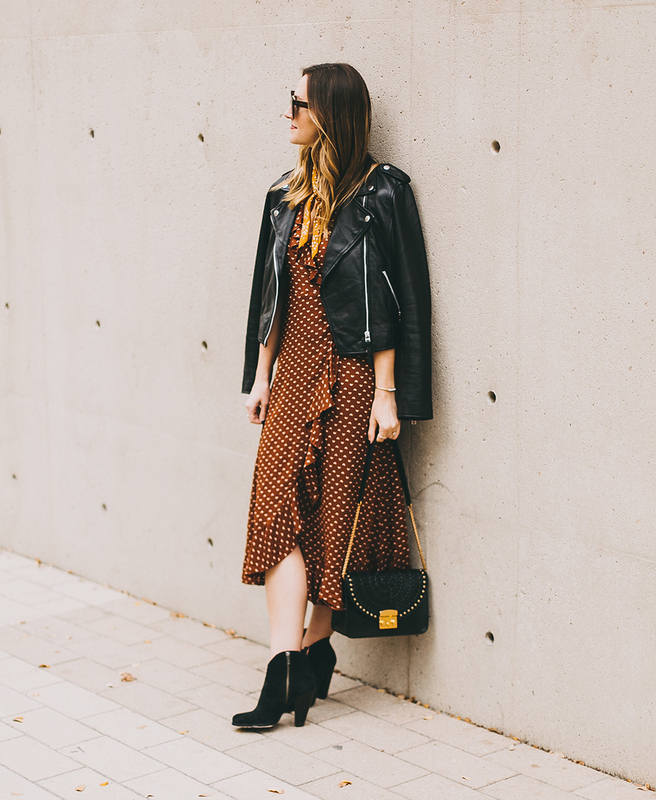 It’s a great price point for the quality and also one of those ultra feminine staple pieces you can wear through every season. 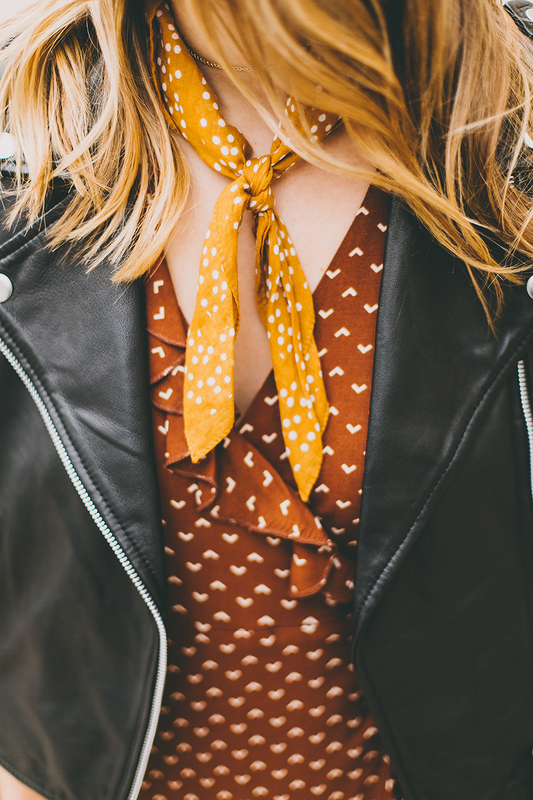 (Pair with sandal wedges in the summer and top-knot your hair with the scarf tied around it – so cute!). 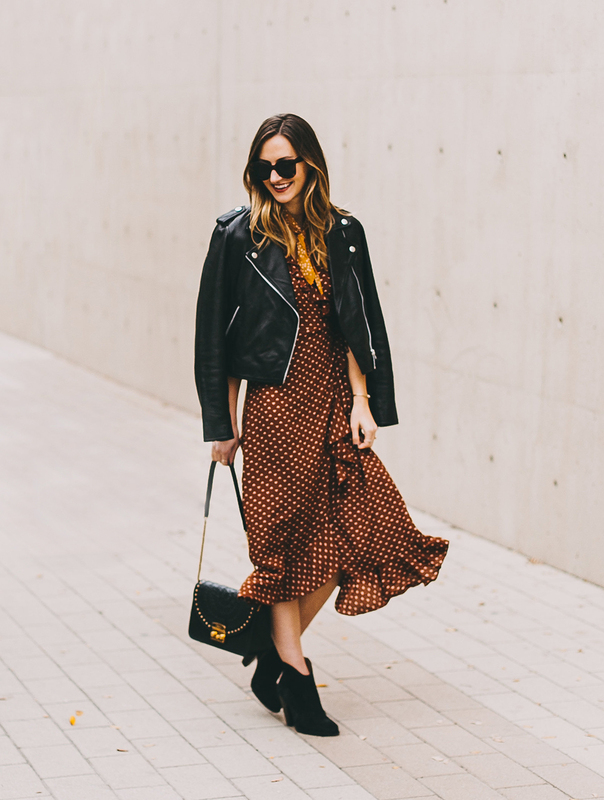 You can take a look at more UO wrap dress options here. 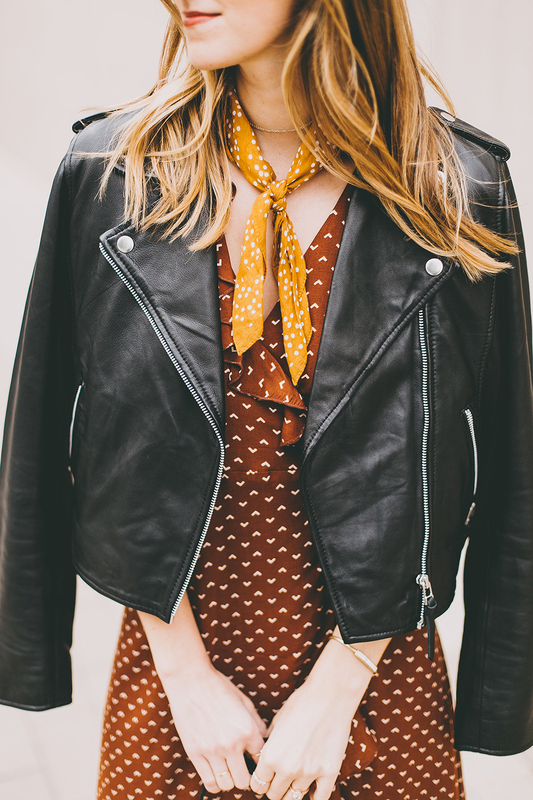 My leather jacket is by Sezane and it is a dreaaaam! Can’t go wrong investing in a leather moto jacket, this thing will never go out of style and adds a perfect touch of edge to any look. I’ll be sharing more ways to wear this pretty thing very soon, so stay tuned! So love this gorgeous dress!! Putting the jacket with it definitely adds to it. You look adorable in it!! Oh, and loving the stylish sunglasses your wearing as well.